As far as stand-alone, portable keyboards go the B1 should get an "A" for performance. Seemingly a more affordable cousin of the Apple keyboard this ultra-light professional tool makes you more effective at whatever you are doing on your mobile device. As it is a device-agnostic controller you can use it with your laptop when reclining comfortably, or type a chat message on Whatsapp on your phone. The B1’s mobility features will delight you as you use it on trains, planes and from the back of Ubers. Shortcuts, hotkeys and a trusty Bluetooth connection all comply with your wishes to help you make the power moves all day. Complete 78 key, familiar resistance, US English QWERTY keyboard. Works via Bluetooth 3.0 connection can be paired with any device compatible and works up to 10m in range. Highly portable, easy to transport in bag or purse. Helpful collection of important hotkeys allows you to control most functions without really lifting a finger. Is powered by 2 AAA batteries (which are not included) and will work for up to 60h non-stop that should last you about a month pending how heavily you use it. 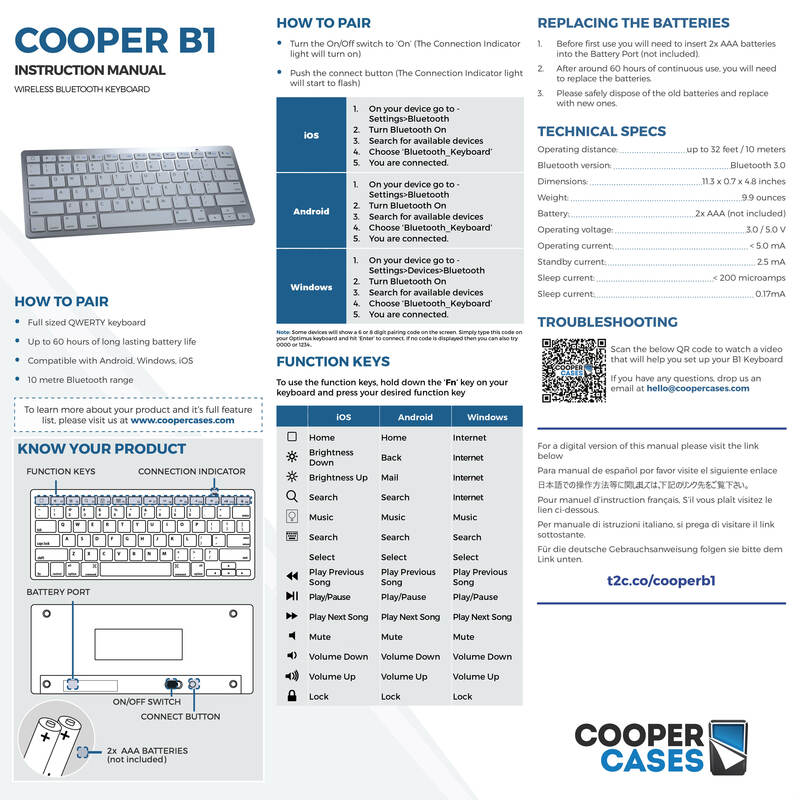 To begin employing the usage of the B1 Keyboard. You’ll find it’s essentially a plug-and-play device. First insert batteries and make sure the power switch, found on the back is on. And once the light comes on and off, enable the Bluetooth signal by pressing the "connect" button to begin pairing. Green A. Reviewed by Green A.
Yvonne F. Reviewed by Yvonne F.
The item arrived perfectly. It seems good. However, I have not used it as it was purchased as a gift for a distant relative in another country. Therefore, I have no idea whether the product works well or not. Sandra M. B. Reviewed by Sandra M. B. Working fine so far but have only used it twice. Very dissatisfied that it took 5 weeks to ship! Masarwa R. Reviewed by Masarwa R.
not an easy pairing.......keys are very close. My frustration with this keyboard is that it often requires striking the key several times at the beginning of each use, even after a period of less than a minute following previous use. Very frustrating. Otherwise, it's fine but this issue occurs every time I use it and it wastes time and is frustrating.